The Treaty of Versailles ended war between Germany and the allies: Russia, France, Great Britain, Italy, Japan, and the United States. The treaty forced Germany into a lot of political, military, and economic chaos. Germany was blamed for starting the war and was blamed for the loss of the allies' citizens in the War Guilt Clause of the treaty. It also restricted Germany's military power. There military couldn't exceed 100,000 people, and they were also restricted on the number of naval ships they had and the amount of people enlisted in the Navy. Germany was forced to pay for war damages, reparations, of $33 billion dollars to the Allies. Germany is still paying off the reparations from the war and will be until 2020. The treaty also created nine new countries. Poland, Czechoslovakia,Yugoslavia, Lithuania and Finland were some of the created countries. The Treaty of Versailles negatively effected Germany and the eventually the world. The treaty set up problems for another war to eventually to be started. The treaty also gave all the blame to Germany in the War Guilt Clause, where Germany the country was given full responsibility for starting the war. Although Germany did have a lot to do in starting the war, it wasn't the sole country responsible. Less than 20 years after the treaty was signed, Germany and its leader Adolf Hitler broke many of the Articles and regulations stated in the Treaty of Versailles. Hitler grew his army past the regulations, started an Air Force and took back land that was taken away from Germany and previously given to other nations. The "Big Three" were the main people involved in the Treaty of Versailles. David Lloyd George of Great Britain, Woodrow Wilson of the United States, and Georges Clemenceau were the three national leaders of the "Big Three." George was an elected official from Great Britain and his views on Germany varied. He was afraid of being soft on Germany and being sent out of office, but he was also afraid of taking away all of Germany's power and letting Russia become a growing communist country. George knew that Germany would be the only country able to stop Russia's growth. Clemenceau thought that Germany should pay for what they started, and they should never be able to start another war. Clemenceau represented France, but unlike George, he and the French public shared the same ideas. Clemenceau didn't change his views because of the public, he believed that taking down Germany was the right and fair thing to do. 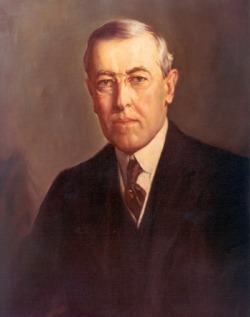 Woodrow Wilson believed in punishing Germany, but not so they would seek revenge and fight back. Wilson was amazed at how the world so civilized can become so uncivilized. Wilson's plan was presented to Congress as"The Fourteen Points." His main points were- All countries in the League of Nations, no secret treaties, and countries should reduce military and weapons. Although none of the "Big Three" received everything they had pleaded and asked for in the Treaty of Versailles, they were all pleased in the end. - March 1935- Adolf Hitler violates the Treaty of Versailles by building his naval and armed forces and creating an Air Force. I think the Treaty of Versailles was a good treaty to end World War I, but it had many flaws. The treaty blamed the war on Germany and set restrictions, regulations, and rules that Germany was bound to break. I also think that out of the “Big Three”, Woodrow Wilson’s views were right and made the most sense, but not to France and Great Britain. I think out of the “Big Three”, George of Great Britain had good ideas, but was too afraid of losing his spot in office. I also believe that Clemenceau had the worst ideas and thoughts out of the three. First, Germany wasn’t the only country responsible for the First World War. The assassination of Archduke Franz Ferdinand lead to war, but the assassination took place in Bosnia by a Serbian nationalist. Germany then declared war on France, only because Austria-Hungary declared war on Serbia and Germany felt that they had to help because of the Triple Alliance they were apart of. When Germany invaded Belgium, Great Britain declared war on Germany and Austria-Hungary. These actions started World War I. The treaty made Germany responsible for 33 billion dollars worth of reparations. Germany couldn’t pay the reparations in hard money because their economy was so weak at the time because of damages suffered from the war. Germany also couldn’t build their army, navy, or air force. Germany also had a lot of land taken away. However, the treaty also treated Russia unfairly. 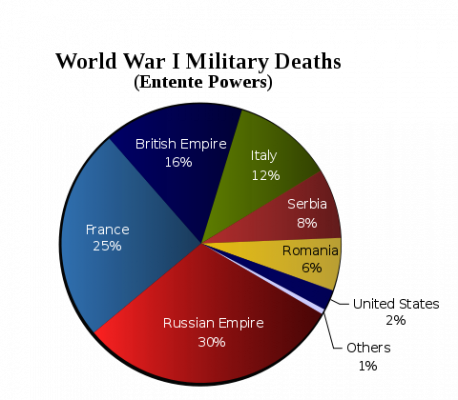 Russia fought with France and Great Britain in the war and had more casualties than any other country, but still lost more land than Germany in the treaty. This happened because Russia was excluded from the peace conference. In 1922 Russia became known as The Soviet Union and wanted to gain its former land back. Second, I think Woodrow Wilson had the most sophisticated and smartest ideas for the treaty. His views weren’t aimed at winning his people over. He wanted peace in the world and wanted the U.S. to maintain it. In his “Fourteen Points”, he wanted weapons and armed forces to be reduced in countries across the world. He was a man of peace and of the people. His fourteenth point was to establish the League of Nations. He wanted this to be an alternative for war, where countries could handle their problems peacefully. Clemenceau and George were all about winning over their people and taking down Germany. Finally, I think Clemenceau had all the wrong views for the Treaty of Versailles. Clemenceau was upset because Germany invaded French territory twice. He does have the right to be mad, but his plan was to take down Germany, worse than the Germans had done to the French. He wanted to take down another country to assure his own countries’ safety. Although George publicly wanted to take down Germany, he was also afraid of Russia. He had the right to be though. Without Germany, Russia would be able to spread its communist rule over Europe. George knew that Great Britain and France needed Germany to be safe. While the Treaty of Versailles may have ended World War I, it set up the works for a second.